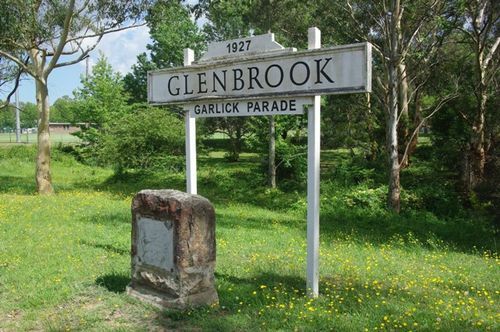 The monument has a sandstone tablet with a bronze plaque on the south (Great Western Highway) face below a timber railway sign on timber posts. The plaque commemorates the deviation of the Great Western Highway in 1926 on the previous alignment of the railway. The railway sign has a panel above with the date 1927, and the address Garlick Parade located below. Note : Commemorative plaque was missing at the time the photo was taken (01-January-2014). "This road is one of the most historic in Australia, and the Main Roads Board and Blue Mountain Shire Council deserve great credit for the work they have carried out here,"said the State Governor in officially opening the just completed Lapstone deviation yesterday, which eliminates many steep grades and dangerous curves on the Lapstone Hill section of the Main Western-road. Miss Elaine de Chair severed the ribbon to officially open the section to traffic, and a long procession of cars, headed by the official party, traversed the deviation and inspected the commemorative tablet. The new route is 4¾ miles in length, and it follows the original zig-zag railway line, which was opened to traffic in 1867. Sunday Times (Sydney), 24th October 1926.